In December 2011, Lauren (“Lolo”) Scruggs, a 23-year-old fashion journalist, suffered a sudden injury that made headlines around the world. She had been on a short flight to look at Christmas lights and, upon exiting the small plane, was hit by the still-moving propeller blade. A frantic 911 call, several major surgeries, and thousands of prayers later: Lauren lived. But she lost her left hand and left eye. And she had to face some incredibly difficult questions: What kind of future will I have? Where is God in all this pain? Will anyone ever be able to love me now? 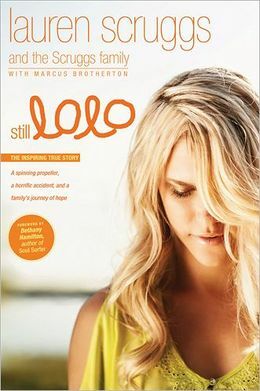 In Still Lolo, Lauren speaks out for the first time since her accident. She and her family reveal what really happened that night, what Lauren’s life is like today, what got them through their journey toward healing, and how they conquered all odds to persevere as a family. It’s a compelling and fiercely beautiful story of faith, determination, and staying true to who you are—no matter what. This has got to be one of the most inspiring books I’ve ever read and definitely the best book I’ve read so far this year!! Amazing story of a family who loves the Lord and who has overcome great struggles that have only strengthened their faith. READ THIS BOOK!! !